1- It is perennial. Yes, unlike hyacinth and tulips, it will naturalize in warm climate zones 9 and greater. 2- One of most fragrant flowers. Yes, it has one of most fragrant flowers among others. The spicy fragrance wafts through the air. And a few plants will fill your whole yard. 3- It is very heat tolerant. Unlike other flowering bulbs, which start withering upon arrival of summer heat, freesia will take the heat and continue blooming. 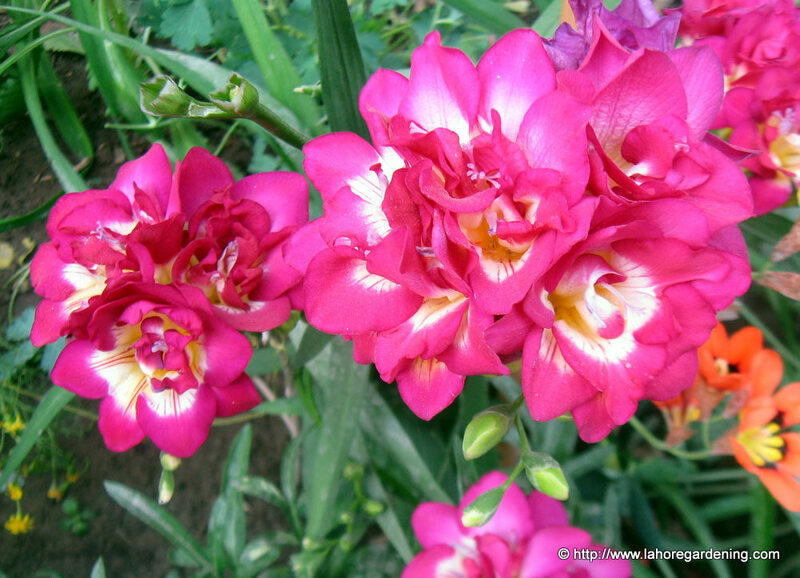 4- Offsets: Freesia produces offsets almost every year, so you will get new plants every year. 5- They are great container plants well. 6- Many beautiful color combination are there. Growing them is very simple. Prepare the soil having fertilizer and potting mix. water the soil thoroughly and let the water get absorbed. Next comes bulbs planting. Choose healthy bulbs, fat and firm. If there are offsets or child bulbs attached, do not remove them, they will flower next year. Plant them in well drained soil in fall. We plant them in late october and november here in lahore. Leave them in either full sun or partial shade, but not in full shade. They will flower in full shade but flowering capacity will reduce. Do not water again until you see green shoots appearing. Remember, water the flowering bulbs as less as possible until heat arrives. This one is in clay pot on my terrace. This one is growing on my terrace in clay pot. This one is growing in my soil bed. 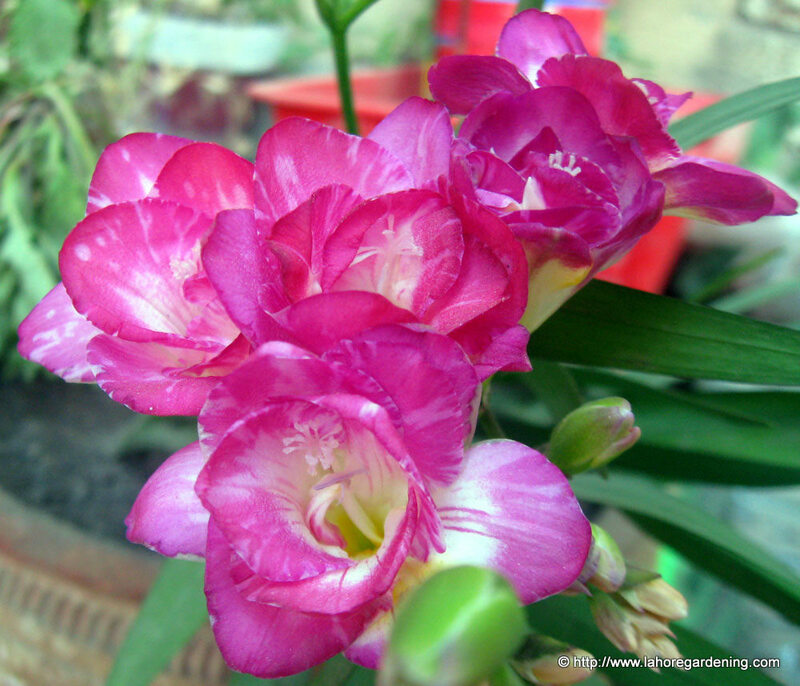 Full double freesia bulbs have often less fragrance. The new hybird varieties have less fragrance although the bloom size is large. So go for semi double which are fragrant as you can see in above pictures, they are all very fragrant. 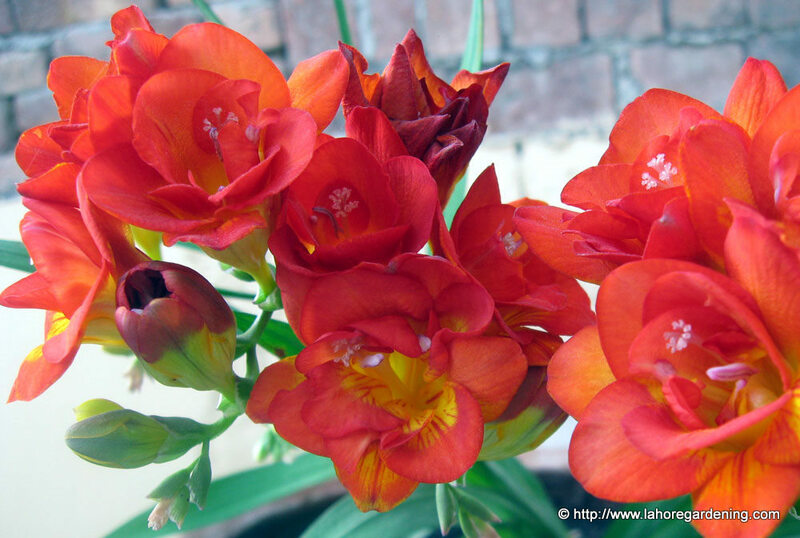 Growing freesia from seed: Freesia can be grown from seed as well. The seed sown in fall will flower in spring. 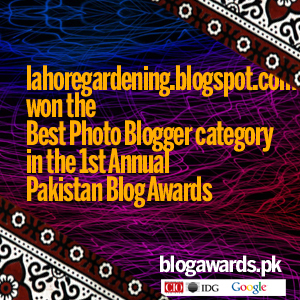 Here in lahore, seed sown in october should flower in march and april. Very easy to grow from seed as well. After freesia has flowered, keep it in the soil. Let the leaves get yellow and then shred all its leaves after it will go dormant in summer. You can keep it in the soil or dig them from soil, wrap in paper and place somewhere cool and dry. They survive in room temperature in lahore if temperature is not very hot. Plant again in fall. Beautiful flower of Freesia! Happy gardening! I planted some for the first time ever here in my hot dry tropical garden, and I’m still waiting patiently for them to flower for the first time. I’m so looking forward to seeing some blooms. thank you for the tips.please guide me whether to take out the bulbs after flowering or to treat them as perrennials and leave them in the pots.waqar peshawer. @Waqas. Better leave them in the soil. And keep watering them in the summer. They should grow again in fall. can you please post some photos of freesia foliage with flowers? 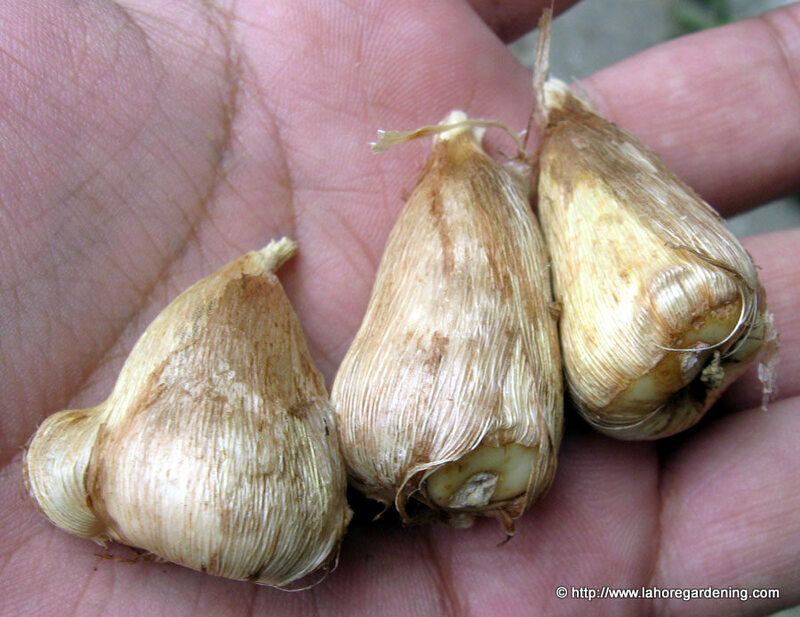 Is there any place i can get freesia bulbs in rawalpindi/islamabad region? I am quite fond of its fragrance. Here in Sydney, Australia, freesias grow freely in our garden lawns and on the street verges. They are considered a ‘pest’ or ‘weed’, as they are not native, and do get out of hand. However, everybody here knows and loves the fragrance, and in Spring (September onwards) we love its scent and how it reminds us of childhood and school days, walking home from school and picking a bunch or two on the way home to give to our Mum. I bought a packet of ten corms from my local nursery about seven years ago and planted them in my lawn just by spiking a little hole about two inches deep with the back of a spoon and putting the corm into the hole, pointy side upwards, and gently pressing the hole closed. [That was about February, so it would be August in the Northern Hemisphere]. Six months later, with no effort or intervention on my part, the leaves of the bulbs came up, out of the grass lawn, and then within a month or so, stalks appeared and then by October, little flowers and then a beautiful scent and aroma began to fill my garden. Seven years later, ie, now, there are many litle clumps of these leaves growing out of the lawn and I expect that there might be about one hundred little freesia plants ready to wash my senses again with the coming spring. We do consider the freesia to be a noxious weed in Australia (that is its official classification)because it upsets the growth and prosperity of native grasses, low growing boronias, herb plants, but it is a very gentle ‘weed’ by comparison to, say, onion weed, which also grows by corms, and is pretty easy to control and the rewards of flowers and fragrance outweighs any objections. Pop those little corms pointy- side up into your lawn or pot at the end of Summer and just sit back. A little water or normal rain, and in the Spring you will have the most wonderful fragrance in your garden or patio. In Australia, we think of the fragrance of the ‘bush’ as being that of eucalypts, turpentines etc, but also we have Bornias, Wattles, Bottle Brushes and the like, all of which emanate the most incredible scents when they flower. But most of our native plants have no real scent (grevilleas, flannel flowers etc) but our gum trees do have a wonderful scent in the summer, when the bees hum and buzz around.Keep gardening and enjoying nature! hi everybody. I´m from Brazil and also love freesias, but they´re little known here. They used to appear in Sept. (just before spring), but have been blooming earlier; this year by end of July. I´ve gotten seeds but it´s not clear when I have to plant them. I´ve read they might take 2-3 years to bloom. Any suggestions? Many thanks and compliments to your site. If you are talking about Convallaria majalis then Sow seeds in October if you are in Karachi or Lahore or similar climate. It is a cool climate plant and does well in pakistan’s hilly areas.